Bollywood actors Kareena Kapoor Khan and Saif Ali Khan's son Taimur Ali Khan is an internet sensation at the tender age of two. Everything that the cute kid does becomes a headline and the toddler has fans around the world. While Taimur's parents have gone on record to say several times that they are concerned with their kid's early fame, his popularity doesn't seem to be going down. From paparazzi itching to capture him and his adorable expressions, to even his dolls being sold, Taimur Ali Khan seems to have become a veritable star. The most recent proof of Taimur's thriving fandom came from reports that Taimur-themed cookies were served at an event in Delhi. Several pictures of the cookies have since surfaced online and people reacted in a number of different ways to them. Restaurateur and Chef Anahita Dhondy, who was also present at the event, shared a picture with the cookies on her Instagram page and the images attracted a string of comments from her followers. Also Read: Watch: Taimur Ali Khan Cuts An Extremely Adorable Cake On His Second Birthday! While some people thought the cookies looked adorable, some others were not so sure. A lot of people also responded with light-hearted humour. "This is another level of crazy ya, but taimur is so cute!! ", said one comment on the post. "Bebo is ready to sue hahaha", said another. "ROFL taimur saab idhar bhi", said another comment on Anahita's post. 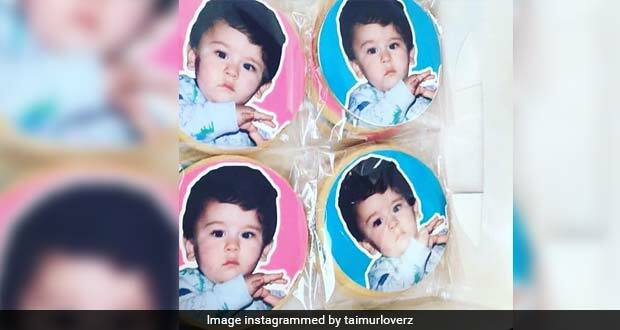 Several other Instagram posts showed the cookies with Taimur's pictures embossed on colourful fondant on cookies and some people expressed their displeasure with the use of a child's face, without permission from his parents. Neither Kareena Kapoor, nor Saif Ali Khan have however, reacted to the news and we don't know for sure, whether or not permission was sought from them. The cookies were made by the bakery The Cake Company and were seemingly commissioned especially for the event. Also Read: A Look At Randhir Kapoor's 71st Birthday Cake From Grandkids Taimur, Kiaan And Samaira Will Make Your Day! What do you think about these Taimur cookies- best or bust? Let us know in the comments section below!